Arthur Conley was an American soul singer. Arthur Conley was born in Georgia in 1946, and grew up in Atlanta. Between 1959 and 1964 he was lead singer of Arthur & The Corvets, with whom he released a few singles on local Atlanta labels. The big stepping stone in his career was in 1965 when Otis Redding heard his song "I'm A Lonely Stranger", and invited him to come and record in Memphis. He became Redding's protégé, and at the Stax studios they recorded two singles (a new version of "I'm A Lonely Stranger", and "Who's Fooling Who") which were released on Redding's newly-formed Jotis label. They then went to Fame Studios in Muscle Shoals for two more singles ("I Can't Stop (No, No, No)" and "Take Me (Just As I Am)", both Dan Penn compositions) which were released on the Fame label. 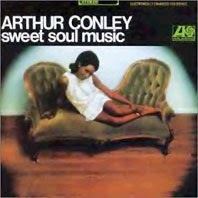 The song which made Arthur Conley was "Sweet Soul Music", which he and Redding wrote together, basing it on Sam Cooke's "Yeah Man". A celebration of the soul genre which name-dropped The Miracles, Lou Rawls, James Brown, Sam & Dave, Wilson Pickett and Otis Redding himself, it was recorded at Fame and released on the Atco label. It became a massive hit, charting at #2 on both the Pop and R&B charts. It was also very popular in Europe, getting to #7 in the UK. Conley's debut album quickly followed, featuring his new hit, the previous four A-sides, and other material recorded at both Stax and Fame (including songs written by either Redding alone or Redding and Conley together). It made for a great southern soul album, interesting in the way the Stax and Fame material can be heard side by side (the Stax recordings sound lean and sparse, compared to the richer, more full-sounding Fame recordings).